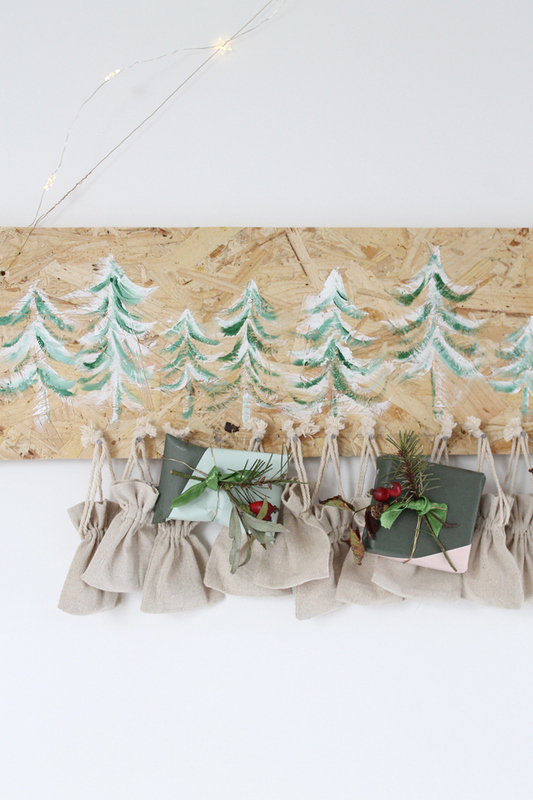 Hooray, here is the first of my Christmas DIY's, a wonderful nature inspired recycled advent calendar! 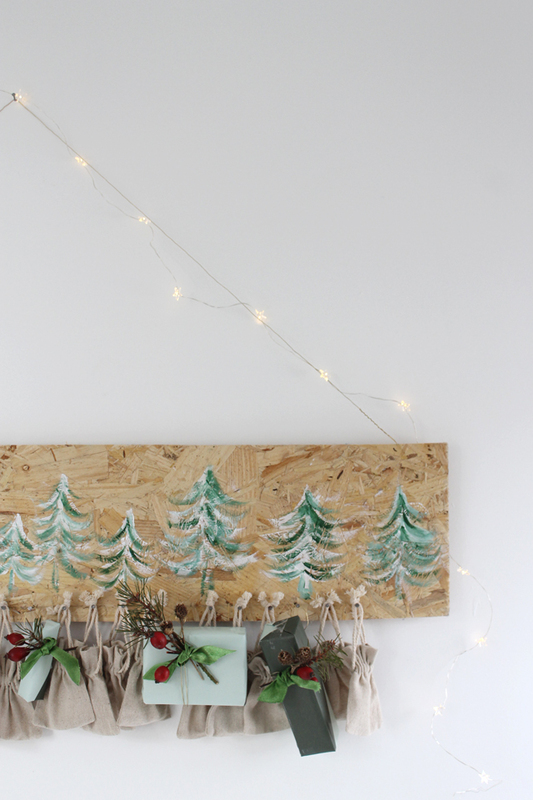 When it comes to Christmas crafting, using up what I have is really important to me, the biggest DIY of the year has been our home renovations so using up spare wood seemed a natural choice when putting together this project. Normally I'm frantically doing something with sticks on the 30th November but this year I have actually got organised. This is a simple DIY to put together, I did mine over the course of a week in 10 minute blocks but if you have more time I think it'll take just over an hour. 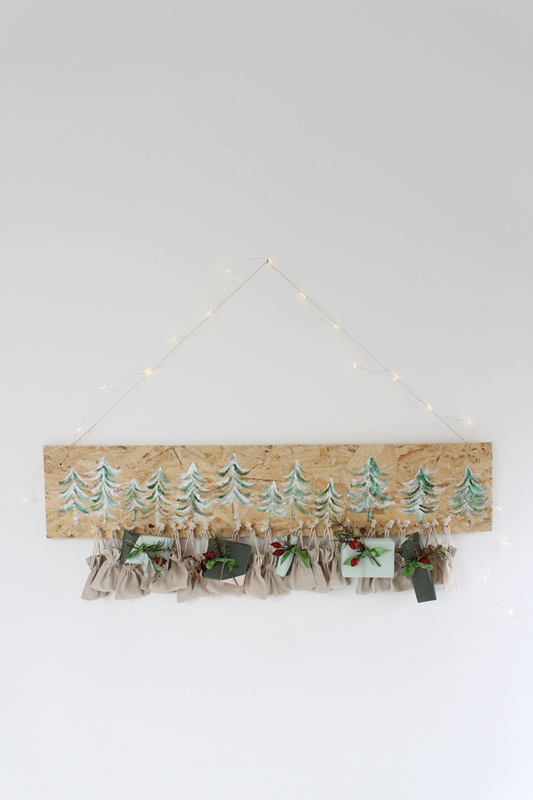 You'll need - piece of wood (this was 18 x 90cm) wire or twine, nails, acrylic paint, small cotton bags, wrapping paper and foliage. Step 1. As I mentioned in the intro. I found this piece of wood on the builders chuck out pile - you could always use drift wood or a small plank from a DIY shop as an alternative, both would work equally well. I drilled a hole in the top corners (make sure you use a wood drill bit), gently drill the front when the blade just reaches the back turn over and gently drill through the hole again, this will give you a neat finish. Repeat on the other corner. If drilling isn't an option then you could always add a nail, eye hook or picture hook instead - it doesn't have to be perfect it just needs to hold the weight of the parcels. Step 2. 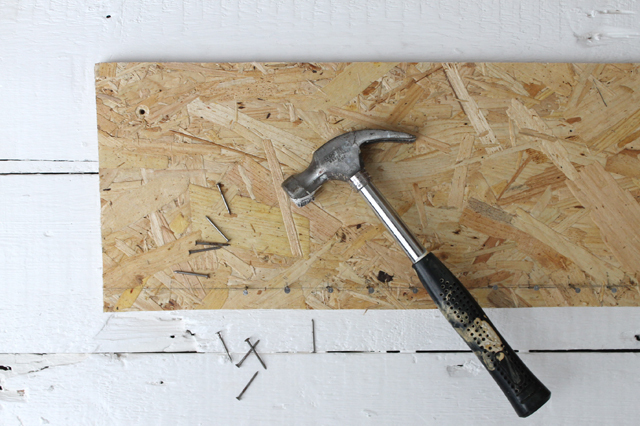 Add a row of nails along the base of the wood. I decided on 3cm spacing between my nails. Measure the centre point of the plank from there measure 1.5cm out in either direction and mark. Work along along the wood marking 3cm intervals, stop when you have 12 marks in each direction. If your piece of wood is bigger/smaller then adjust the spacing between your marks. Hammer a nail into each mark, leaving enough length to hang presents. Step 3. Now it starts to get fun! 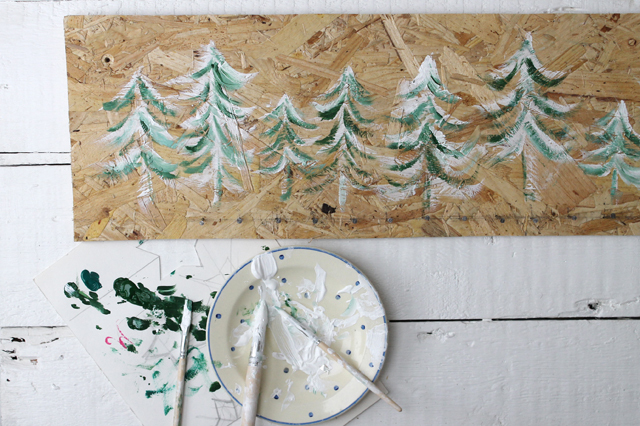 To mirror the wood I decided on a tree theme but you could paint anything Christmas-y; stars, snowflakes, reindeer etc etc. Using white acrylic paint I painted a trunk then painted swishy curvey branches, I then went over the white paint when it was still wet with green acrylic to create snow capped trees, adding in a bit more white paint if needed. Step 4. 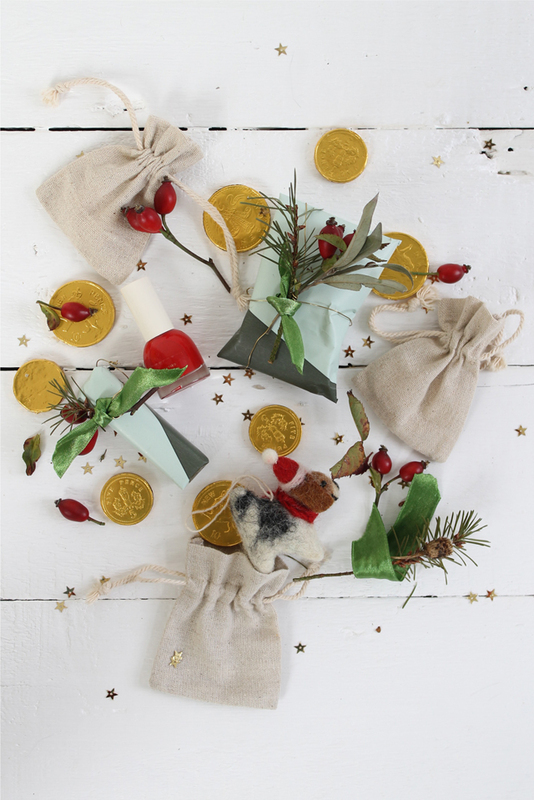 Fill your little bags with treats and wrap small gifts that won't fit. Last year I went for a sock theme this year I seem to have bought myself a few beauty bits (oops!). 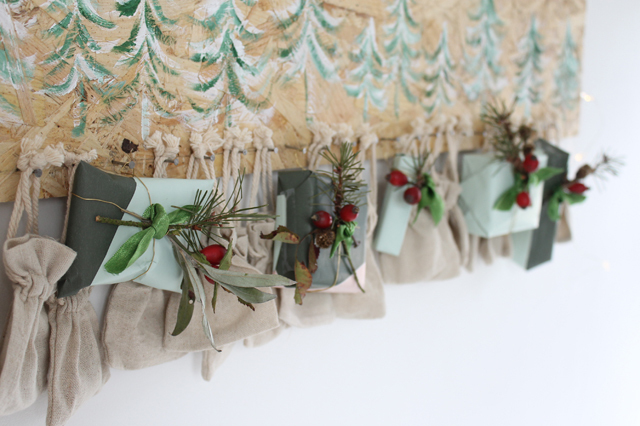 You of course can fill these bags with whatever you like; if you're making for little ones I like the idea of adding a surprise days out, I think a good cracker joke or two would be fun and I always include a new tree decoration. For the wrapping I used left over paper from this tutorial and added foliage like I did in this tutorial. Step 5. 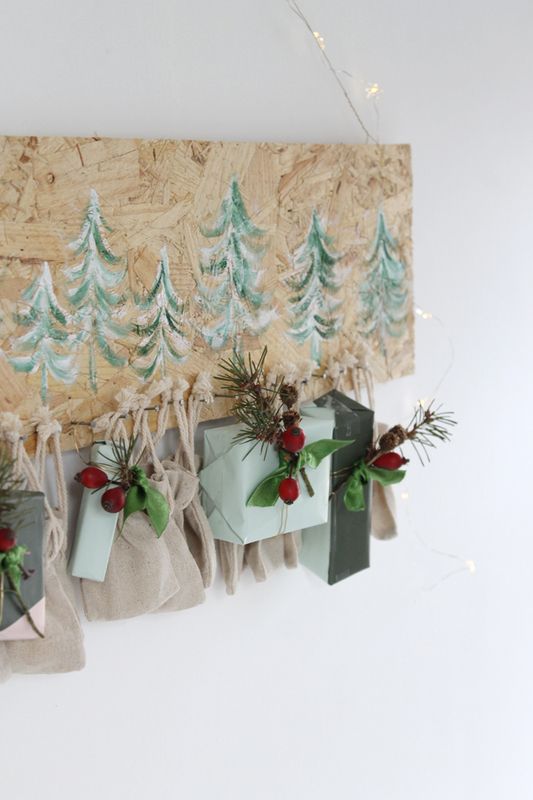 To hang, thread wire or string through the holes and then hand the bags and parcels to the nails, you might need to jiggle the presents around so that it hangs evenly with the weight of the presents.